Liam Hemsworth and Miley Cyrus at Lennox Head. 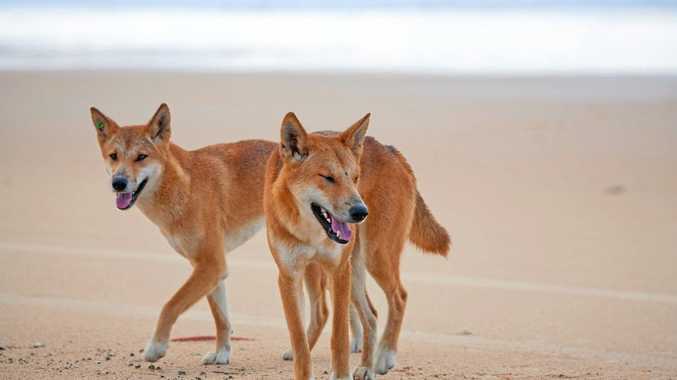 PHOTO: Julie Creed /Facebook. 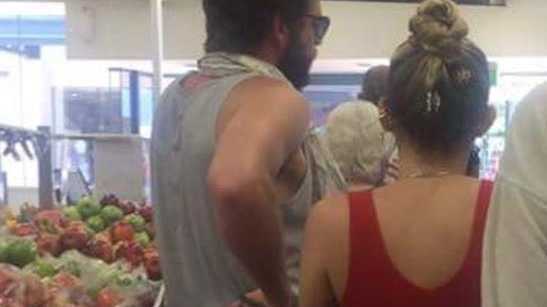 IT WAS scorching day on the Northern NSW coast, but even hotter was the social media buzz after Hollywood A-listers Miley Cyrus and Liam Hemsworth were spotted shopping at a supermarket in Lennox Head. Dressed casually, the famous couple have been staying near Byron Bay at Chris Hemsworth's pad since New Year's Eve and could have been mistaken for any holiday-maker. But locals were quick to recognise the Malibu singer and her actor fiance, also celebrating his 28th birthday today, in a shopping queue. Julie Creed took a photo of the couple waiting in line to pay for their groceries, and posted it on Facebook's Lismore Information Exchange. Michael McCaughey said: "Celebs come to this area to escape the madding crowd...and..get...a slightly less madding crowd, who holiday in the hope of seeing a celeb." Hayley Evans said: "Someone needs to twerk all over them and start singing 'it's a party in IGA'." Julianne Currie said: "Good for them, I hope they have a nice holiday. Cyrus and Hemsworth have also posed for selfies with fans in recent days. #lovemybf!!! !#liamhemsworth#catchingmybreathback I knew I would meet the love of my life in Aussieland!!! Señal del universo. Sweet poison!!!! Meanwhile, Chris Hemsworth's wife Elsa Pataky has used social media to respond to remarks about Angelina Jolie sitting next to her man at the Golden Globes this week, after fans said Hemsworth looked like Jolie's ex, Brad Pitt. Pataky said on Instagram: "What a great couple! I mean you boys! ", referring to Thor director Taika Waititi, also sitting at the table. 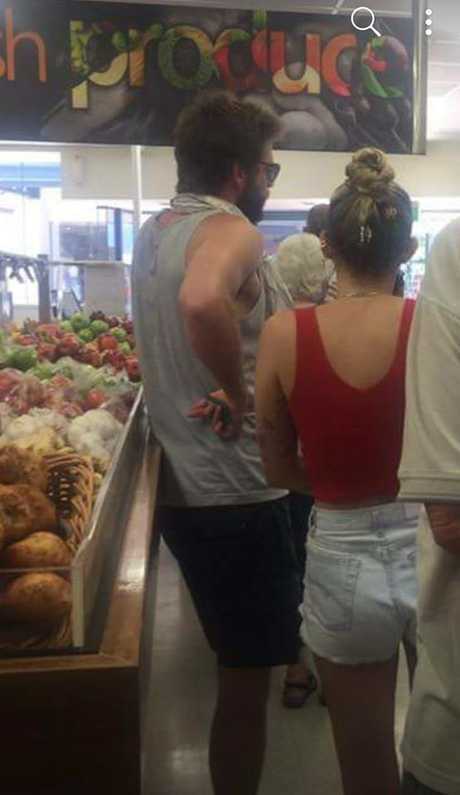 Liam Hemsworth and Miley Cyrus at Lennox Head.